I am not an expert on the Civil War (or any sort of history), but I have a slightly better than average knowledge of the Civil War thanks to some research for various projects I’ve worked on. Fortunately, for those interested in the Civil War, there is a treasure-trove of material out there, some still waiting to be mined, as evidenced by Ural’s noting of the discovery of a chest full of letters from the time. It is such finds that keeps me interested and reading books like this. Given the subtitle, “The Civil War in the Words of Those Who Lived It,” I really was expecting something a little different from what Ural presents. I expected to read entire letters and correspondence between soldiers and those still at home. I thought we’d get photographs of letters, and perhaps memorabilia or good-luck charms that may have been sent to soldiers. But what we get are snippets of correspondence and Ural’s well-researched explanations of what was happening in and around the areas that the writers write about. There is some information which was new to me, or at least presented in a new way that struck me, but for the most part I never really felt that I was getting that unique story, the one that you can only get from the person who was in the middle of it. There are other books about the Civil War that have actually given me a better impression of what it was like. If I were researching for information about the Civil War, I would certainly include this book, but I wouldn’t say that this was the best book, or the only book anyone should read to get a feeling of what it was like for the men and women who lived (and died) in America’s Civil War. Looking for a good book? 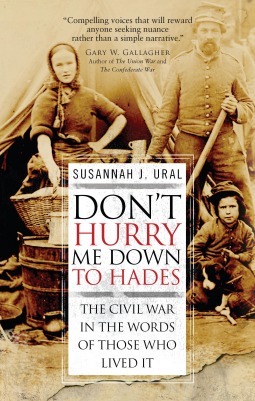 Don’t Hurry Me Down to Hades is a good start for anyone interested in learning more about the Civil War.